Abstract: Mood disturbances have been documented in cerebral autosomal dominant arteriopathy with subcortical infarcts and leukoencephalopathy (CADASIL). The highly varied morbidity indicates that the affective symptoms in CADASIL have not been cataloged systematically, leading to ineffective treatment, affecting the patients’ quality of life, and possibly resulting in suicide. We present a case of CADASIL with bipolar II disorder as the first manifestation. A middle-aged female reported recurrent depressive episodes and appeared treatment resistant to adequate dosages and durations of antidepressants. Following a structured psychiatric interview and neuropsychological assessment, a past episode of hypomania was identified. Added treatment with sodium valproate alleviated most symptoms. Considering late-onset bipolar disorder with unexplained decline in cognition, a medical history of migraine, and a suspected family history of stroke, further cranial magnetic resonance imaging scan was performed and revealed severe leukoencephalopathy, prompting further investigation. The diagnosis was revised to CADASIL after Arg587Cys NOTCH3 mutation was confirmed. This case highlights the evolving process of affective disorder diagnosis and underlying organic etiologies. Based on the overlap of white matter hyperintensities, NOTCH3 mutation, and valproate therapy in bipolar disorder and CADASIL, bipolar II depression may be a poorly recognized manifestation of CADASIL. Well-designed clinical trials are warranted to verify the current findings. To our knowledge, relatives of patients with bipolar disorder are more likely to develop bipolar symptoms than those of unipolar depression patients.13 Increasingly, studies of bipolar disorder have utilized neuroimaging.14 Similar white matter hyperintensities and Notch genetics have been described in bipolar disorder and CADASIL, suggesting that the two conditions may be related. In this paper, a Chinese female with CADASIL initially presented with bipolar II disorder symptoms; we will characterize the comprehensive clinical and psychiatric aspects of the disease. The patient received a full description of the study and provided written informed consent permitting publication of case details and accompanying images. Ms C, a 46-year-old female, presented to the Department of Neurology and Psychology complaining of loss of interest and “whole body” discomfort, occurring over the past 4 years. She first suffered from a depressed mood in her 40s and it recurred almost every year. She became sensitive and felt uncomfortable, as if insects were crawling around under her skin. She had multiple somatic pain symptoms and became irritable. Her condition got much worse when she felt total despair with the onset of sudden suicidal thoughts, but had no suicidal plans or attempts. She was prescribed courses of different antidepressants, including fluoxetine (40 mg/d), paroxetine (30 mg/d), sertraline (100 mg/d), and escitalopram (20 mg/d), respectively, starting 3 years prior to admission. None of these drug regimens resolved her symptoms completely, despite taking them consistently at adequate dosages and for appropriate durations. On admission to the psychology clinic at the Shenzhen Hospital of Chinese Medicine, we performed a detailed psychiatric interview. Ten years prior to admission, the patient had experienced a brief period of unusually elevated mood without inducement, during which she was very hyperactive and energetic with rapid and pressured speech. These symptoms resulted in behavioral changes, but did not cause major impairments to daily life or work. Following the initiation of depressive symptoms, she developed mild migraines without aura that occurred periodically, especially during episodes of depressed mood and fatigue. Ms C’s other medical history was unremarkable, apart from a cesarean section 23 years prior to admission. Her father, who had taken antidepressants in adulthood, died suddenly at age 55 from a suspected stroke. The patient’s physical and neurologic evaluation values were within normal limits. Her mental condition showed no evidence of delusions, hallucinations, or mania, but she had evidence of depressed mood, feelings of worthlessness, lack of interest, fatigue, increased appetite, sleep disturbances, and anxiety. She demonstrated normal insight into her mood changes and behavior. Neuropsychological testing revealed that cognitive tests were inconsistent between Chinese Mini-Mental State Examination 28/30 and Montreal Cognitive Assessment-Chinese 24/30, with a slight impairment in executive function detected. The Hamilton Depression Scale (34/68) and the Hamilton Anxiety Scale (25/56) indicated relatively severe depression and moderate anxiety. The Hypomania Check List-32 score (15/32) demonstrated occurrence of an episode of hypomania. She was diagnosed with bipolar II disorder according to the criteria of the Diagnostic and Statistical Manual of Mental Disorders, Fifth Edition. After evidence of low compliance with lithium treatment was obtained, she was prescribed sodium valproate (1,000 mg/d), which resolved the majority of her problems including the migraines. The patient remains stable on monotherapy with sodium valproate (750 mg/d) in follow-up. After late-onset bipolar disorder with atypical features was identified, a cranial magnetic resonance imaging (MRI) scan was performed, which revealed severe leukoencephalopathy. High signal intensity of the periventricular white matter, bilateral centrum semiovale, and right external capsule was found by fluid-attenuated inversion-recovery images (Figure 1A–E); anterior temporal poles were not involved (Figure 1F). The clinical features and MRI findings were highly suggestive of CADASIL, so genetic testing for NOTCH3 mutations was performed. As expected, a heterogeneous mutation was detected in this patient that produced an arginine to cysteine substitution in exon 11 of chromosome 19p13.2–13.1 (p.Arg587Cys). Results of routine laboratory tests including routine bloods, human immunodeficiency virus antibodies, and thyroid function were negative. The diagnosis was revised to CADASIL and bipolar II disorder. 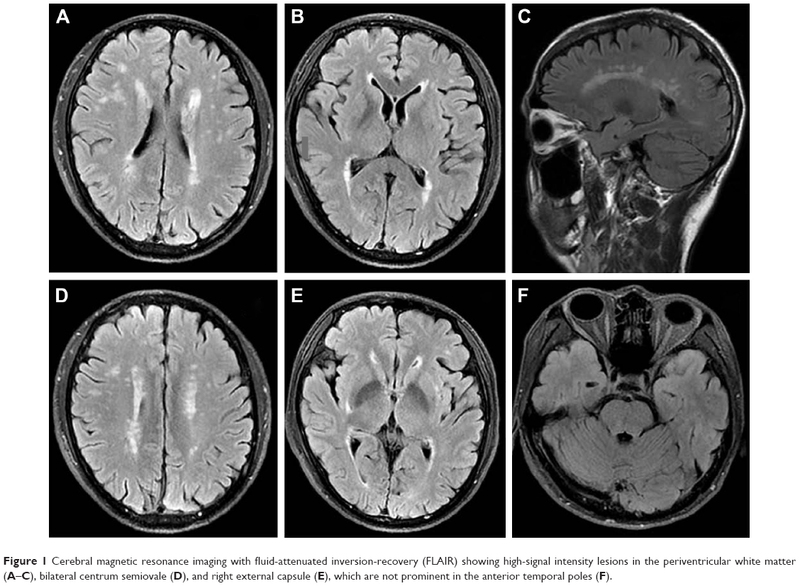 Figure 1 Cerebral magnetic resonance imaging with fluid-attenuated inversion-recovery (FLAIR) showing high-signal intensity lesions in the periventricular white matter (A–C), bilateral centrum semiovale (D), and right external capsule (E), which are not prominent in the anterior temporal poles (F). This case report describes an individual with bipolar depressive illness rather than the more common neurologic presentations of CADASIL. This underdiagnosed manifestation provides new insights into the many clinical variations of CADASIL. Given the coincidental symptomatology, leukoaraiosis, and genetics of bipolar disorder and CADASIL, our report indicates that bipolar II disorder may be a poorly recognized manifestation of CADASIL. We propose that any CADASIL patient presenting with mood disturbances undergo a detailed medical history of prior manic or hypomanic episodes. Additionally, whenever a marked leukoencephalopathy is detected in bipolar disorder, CADASIL should be considered as a possible differential diagnosis, particularly when late-onset affective patients possess a family history of stroke, migraine, or dementia. The authors thank the patient for her cooperation and understanding of this research. Chabriat H, Joutel A, Dichgans M, Tournier-Lasserve E, Bousser MG. Cadasil. Lancet Neurol. 2009;8(7):643–653. Joutel A, Corpechot C, Ducros A, et al. Notch3 mutations in CADASIL, a hereditary adult-onset condition causing stroke and dementia. Nature. 1996;383(6602):707–710. Dichgans M, Mayer M, Uttner I, et al. The phenotypic spectrum of CADASIL: clinical findings in 102 cases. Ann Neurol. 1998;44(5):731–739. Chabriat H, Bousser MG. Neuropsychiatric manifestations in CADASIL. Dialogues Clin Neurosci. 2007;9(2):199–208. Valenti R, Pescini F, Antonini S, et al. Major depression and bipolar disorders in CADASIL: a study using the DSM-IV semi-structured interview. Acta Neurol Scand. 2011;124(6):390–395. Valenti R, Poggesi A, Pescini F, Inzitari D, Pantoni L. Psychiatric disturbances in CADASIL: a brief review. Acta Neurol Scand. 2008;118(5):291–295. Leyhe T, Wiendl H, Buchkremer G, Wormstall H. CADASIL: underdiagnosed in psychiatric patients? Acta Psychiatr Scand. 2005;111(5):392–396; discussion 396–397. Dericioglu N, Vural A, Agayeva N, Basar K, Anil Yagcioglu AE, Gursoy-Ozdemir Y. Cerebral autosomal dominant arteriopathy with subcortical infarcts and leukoencephalopathy (CADASIL) in two siblings with neuropsychiatric symptoms. Psychosomatics. 2013;54(6):594–598. Benazzi F. Bipolar II disorder: epidemiology, diagnosis and management. CNS Drugs. 2007;21(9):727–740. Doran CM. The Hypomania Handbook: The Challenge of Elevated Mood. Philadelphia, PA: Lippincott Williams & Wilkins; 2008. Novick DM, Swartz HA, Frank E. Suicide attempts in bipolar I and bipolar II disorder: a review and meta-analysis of the evidence. Bipolar Disord. 2010;12(1):1–9. Goffin KC, Dell’Osso B, Miller S, et al. Different characteristics associated with suicide attempts among bipolar I versus bipolar II disorder patients. J Psychiatr Res. 2016;76:94–100. Post RM, Altshuler LL, Kupka R, et al. Illnesses in siblings of US patients with bipolar disorder relate to multigenerational family history and patients severity of illness. J Affect Disorders. 2017;207:313–319. Soares J. 773-Neuroimaging abnormalities identify neuroprogressive course of bipolar disorder. Biol Psychiat. 2017;81(10):S314. You J, Liao S, Zhang F, Ma Z, Li G. First report of Arg587Cys mutation of Notch3 gene in two Chinese families with CADASIL. J Stroke Cerebrovasc Dis. 2017;26(1):e1–e4. Nasrallah HA. Consequences of misdiagnosis: inaccurate treatment and poor patient outcomes in bipolar disorder. J Clin Psychiatry. 2015;76(10):e1328. Marlinge E, Bellivier F, Houenou J. White matter alterations in bipolar disorder: potential for drug discovery and development. Bipolar Disord. 2014;16(2):97–112. Saricicek A, Zorlu N, Yalin N, et al. Abnormal white matter integrity as a structural endophenotype for bipolar disorder. Psychol Med. 2016;46(7):1547–1558. Redlich R, Almeida JJ, Grotegerd D, et al. Brain morphometric biomarkers distinguishing unipolar and bipolar depression. A voxel-based morphometry-pattern classification approach. JAMA Psychiatry. 2014;71(11):1222–1230. Mwangi B, Wu MJ, Cao B, et al. Individualized prediction and clinical staging of bipolar disorders using neuroanatomical biomarkers. Biol Psychiatry Cogn Neurosci Neuroimaging. 2016;1(2):186–194. Spuhler K, DeLorenzo C, Parsey R, Huang C. 933-Entropy analysis shows temporal pole diffusivity changes in bipolar disorder. Biol Psychiat. 2017;81(10):S377–S378. Di Donato I, Bianchi S, De Stefano N, et al. 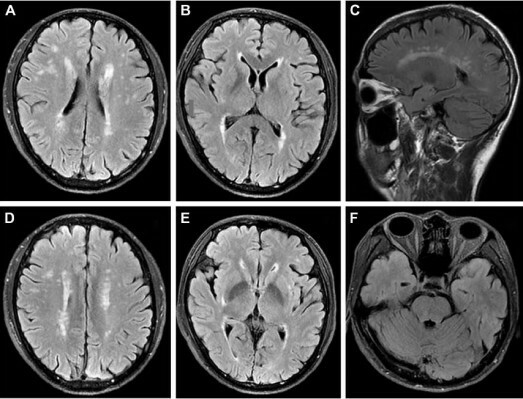 Cerebral autosomal dominant arteriopathy with subcortical infarcts and leukoencephalopathy (CADASIL) as a model of small vessel disease: update on clinical, diagnostic, and management aspects. BMC Med. 2017;15(1):41. Ahearn EP, Speer MC, Chen YT, et al. Investigation of Notch3 as a candidate gene for bipolar disorder using brain hyperintensities as an endophenotype. Am J Med Genet. 2002;114(6):652–658. Pedroso I, Lourdusamy A, Rietschel M, et al. Common genetic variants and gene-expression changes associated with bipolar disorder are over-represented in brain signaling pathway genes. Biol Psychiatry. 2012;72(4):311–317. Yuan P, Salvadore G, Li X, et al. Valproate activates the Notch3/c-FLIP signaling cascade: a strategy to attenuate white matter hyperintensities in bipolar disorder in late life? Bipolar Disord. 2009;11(3):256–269. Martikainen MH, Roine S. Rapid improvement of a complex migrainous episode with sodium valproate in a patient with CADASIL. J Headache Pain. 2012;13(1):95–97.